Frances Watts and Ann James have delivered an early Christmas present in the shape of a book called A Very Quacky Christmas. Enter Samantha Duck who is preparing for the festive season. The first step is Christmas decorations: tinsel, baubles, and Christmas stockings. But Samantha's friend Sebastian doesn't think animals should celebrate Christmas, so Samantha tries to explain to him what Christmas means to her, the most important thing being giving and sharing. Samantha and Sebastian plan to give and share with all the animals who live on their farm. And they are putting a lot of effort into making their own special gifts. It doesn't take long for the other animals to get into the spirit of Christmas, and soon it is a busy and enjoyable celebration, with Samantha singing 'We wish you a quacky Christmas' all over the place. As Samantha tries to fulfil her Christmas plans, she encounters difficulties, and becomes uncertain of herself, but perhaps a Christmas miracle will put things to rights. Frances Watts has written a lovely feel-good story, with a positive message. Its playful and yet somewhat serious tone is illustrated in a simple, expressive style by Ann James. 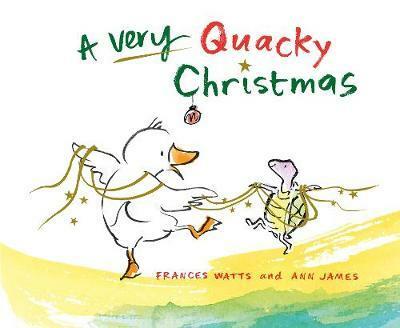 A Very Quacky Christmas can be enjoyed by the whole family, and is especially suited to younger children.